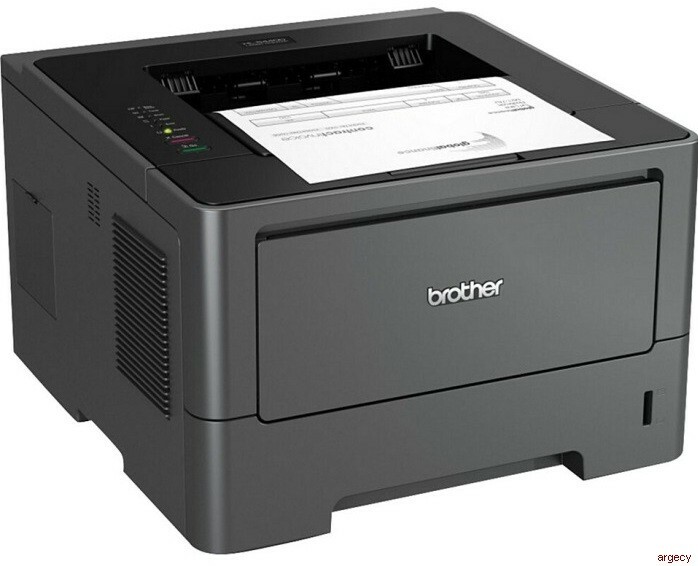 The Brother The HL-5440D is a cost efficient laser printer built for day-in and day-out printing. It features reliable, fast printing at up to 40ppm and produces crisp, high-quality output. It also offers PCL6, BR-Script3, IBM Proprinter, and Epson FX emulations for compatibility with virtually any office or graphics application. Plus, the HL-5440D provides Parallel and USB 2.0 interfaces for local connectivity and DOS printing, automatic duplex printing for producing professional two-sided documents, and flexible paper handling via its 300-sheet paper capacity. For lower running costs, a high-yield 8,000-page replacement toner cartridge is available. Fast, high-quality output. With a print speed of up to 40 pages per minute, this printer is ideal for busy offices. Plus, it offers up to 1200 x 1200 dpi resolution for crisp, clear text and excellent graphics. Maximum compatibility. Offering PCL6, BR-Script3, IBM Proprinter, and Epson FX emulations, the HL-5440D can support virtually any office or graphics application. Cost efficient performance. Spend less time replacing supplies and help reduce running costs with high-yield 8,000-page replacement toner cartridge. Versatile paper handling. The Brother HL-5440D offers an adjustable 250-sheet capacity paper tray for letter or legal size paper and a 50-sheet capacity multi-purpose tray for printing letterhead and custom paper sizes. Add an optional 500-sheet capacity paper tray for additional capacity. Automatic duplex printing. Produce professional two-sided documents, brochures, and booklets with ease. Duplex printing can help save money and reduce your paper use. Straight-Through Paper Path. A convenient fold-down, 50-sheet capacity multi-purpose tray and back paper exit provide a straight-through paper path for printing envelopes, thicker media and custom paper sizes. Advanced security features. Provides a wide-range of security features including: Secure Function Lock, Enterprise Security (802.1x) and more. Outstanding customer support. The Brother HL-5440D offers a 1 year limited warranty with free phone support for the life of your machine. Unit Dimensions (W"xD"xH") 14.6" x 15.1" x 9.6"
Carton Dimensions (W"xD"xH") 19.6" x 18.8" x 15.0"
Unit Weight (lbs) 22.9 lbs. Carton Weight (lbs) 27.3 lbs. All trademarks, brand and product names are property of their respective companies. Windows Vista, Windows Server, Windows and the Windows logo are trademarks of Microsoft United States and/or other countries. Mac OS, the Mac logo and OS X are trademarks of Apple Inc. registered in the U.S. and other countries. "In-Box" Consumables (Yield) Approximate toner cartridge yield in accordance with ISO/IEC 19752 (letter/A4). Drum yield is approx., and may vary by type of use. For more information see www.brother.com/pageyield. Carton Contents Approximate toner cartridge yield in accordance with ISO/IEC 19752 (letter/A4). Drum yield is approx., and may vary by type of use. Max. Monthly Duty Cycle Maximum number of printed pages per month and can be used to compare designed durability between like Brother products. For maximum printer life, it is best to choose a printer with a duty cycle that far exceeds your print requirements. Optional Paper Capacity (sheets) Maximum capacity based on using 20 lb. (bond) paper. Additional purchase required. Recommended Monthly Print Volume The recommended range of monthly printed pages to achieve the best possible performance and printer life. Printers are intended to handle occasional usage beyond this range with little or no effect. Consistently printing above the recommended print volume, however, may adversely affect the print quality or life of the machine. It is always best to choose a printer with an appropriate recommended print volume to allow for any anticipated increase in printing needs. Standard Input Paper Capacity (sheets) Max. capacity based on using 20 lb. paper.